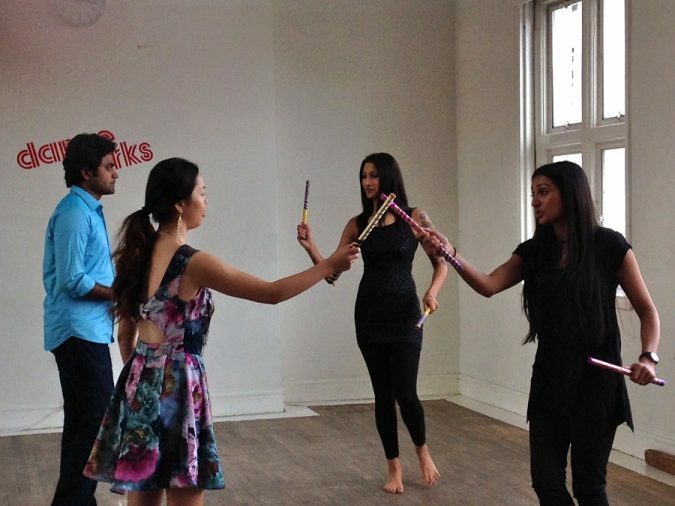 To help get in the mood for the upcoming Navratri celebrations which this year fall between the 5th and 14th October 2013, Absolute Bollywood held a special workshop at Danceworks studio in London’s Bond Street with the talented Urvashi teaching the one-off class! During the 1.5 hours, she managed to teach the three popular Navratri dance styles- Dandiya Raas, Garba and Ranganyu. Everyone especially loved the Dandiya Raas, which is performed in circles with a stick in each hand! For those of you not familiar with Navratri, it is a Hindu festival dedicated to the worship of the deity Durga, and the word ‘Navratri’ is Sanskrit for ‘nine nights’. As part of this festival, which is especially important in the Gujarat area of India, traditional dances are performed by both men and women as part of the celebrations.